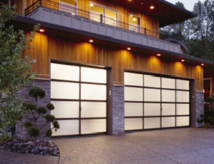 Transform your home’s appearance with the modern look of a glass and aluminum garage door. The Clopay Avante collection gives you the opportunity to customize a new garage door for your home. Access the beauty of natural light during the day, and return home to a warm glow at night. Different window options allow you to choose the right degree of natural light for your home and privacy needs. You can even add a splash of color by choosing aluminum panels to match your favorite frame. Durable, low-maintenance 2-1/8″ commercial grade aluminum frame with many glazing options. Frame and solid aluminum panels available in choice of anodized and powder-coated finishes or Ultra-Grain wood finishes. White, Bronze, Brown, Clear Anodized, Bronze Anodized, Black Anodized, Ultra-Grain Light Cherry, Ultra-Grain Dark Cherry. Tempered glass, acrylic or solid aluminum panel options. Insulated glass is available for increased energy efficiency. Custom glass and colors available. Color-matched aluminum grip handle.